For those of you getting into the Christmas spirit, I present the most important video you'll watch all day. With the stress level lower since securing a place within Switzerland for the next few years, I've committed myself to doing more regular reading on the topic of early music. The first first batch of books arriving in my mailbox this week contains J.J. Quantz's classic, On Playing the Flute (a translated version by Edward R. Reilly). While I have read numerous selections from the book before, I thought it would be a good time to go through it from the beginning to get a better overall view of the work. Funnily enough, it begins with an striking introduction: Of the Qualities Required of Those who Would Dedicate Themselves to Music. Last Friday saw the premiere professional performance of the Bach Akademie Luzern in a production of J.S. Bach's Christmas Oratorio at the Matthäuskirche in Lucerne. The first of three performances, the Orchestra, Choir, and Soloists will continue on to perform this week around Switzerland. Early music, the movement, has a diverse community. There are those who are drawn to it as an activity, some who dedicate their lives to research, others to teaching, more still who hope to make their living performing. But what motivates that third group? In Basel, a place which has traditionally been at the forefront of the movement, philosophies of performance are by no means unified, a fault which has many consequences for performers and audiences alike. The Grand Concerto for 24 Bassoons is Published! This month, my Concerto Grosso for 24 bassoons was published by TrevCo Music Publishing. The work was premiered last May as part of my final recital at the Schola Cantorum Basiliensis. You can read about the work, as well as watch a selection from the performance by clicking here. If you are interested in purchasing the music, you can find it on the TrevCo Music Publishing website. For months I've been brooding over a term which I see appearing more and more. An article in The Strad published a few months ago, while written about an organization with the best of intentions, included the words 'young' or 'youngster' several times. The Jumpstart Jr. program offers a much needed springboard for a select few string instrumentalists. The competition is tough, and the winners are "usually at the start of their career, freshly out of college, but have already established a reputation for excellence in their field," says Kati Debretzeni, OAE leader and artistic advisor to the York Early Music Festival. It's very easy to think of medieval music as a rather limited genre. Not so. In fact, medieval music encompasses nearly a millennia of musical output with an incredible array of styles and particularities, depending on the time and region. More startling still is the knowledge required to unlock countless forms of notation and numerous early European languages to breathe life once more into an ancient manuscript. Earlier this year I spent two evenings recording with my ensemble Primary Colours. While we were mainly working on chamber music, at the end of the second day there were 20 minutes left with our sound engineer. Leading in to those sessions I had been working on arranging a number of Fantasias from Telemann's Fantasie per il Violino senza Basso. When I realized I had enough time at the end of the project to record one of them, I jumped at the chance. Have a listen to the result. John Ernest Galliard's Six Sonatas for Bassoon (1733), a collection which he is mainly remembered for today, are deceptively presented. At face value, the modern bassoonist would see them as simplistic pieces with a number of quirky movements. Because of this, the sonatas have been relegated to the 'beginner' repertoire lists of numerous conservatories and you would almost never find one included in a serious recital program. When I am given the opportunity to speak in front of a group of musicians, I usually conduct an exercise or two. One of my most though-provoking involves asking all the participants to write down two rational reasons (or as close to as possible) why they should have a performing career. The only things which they are no allowed to write down are "I can't imagine doing anything else," or "I love to do it." After 5 minutes or so, the participants reveal their reasons. The funny thing is, most of the time hardly anyone can think of something which they themselves believe is legitimate. It seemed that many of the people who I'd gone through this exercise with started on a path and never questioned why performing was important to them. Even years after the experiment, some have told me that they still haven't come up with anything. I've struggled with since I came to Basel four years ago. A Concerto for 24 Bassoons?! Last May I performed my final recital at the Schola Cantorum Basiliensis. The program centered around the music of English theater composers from the first half of the 18th century. My goal for the evening was to posit that works by composers contemporary to G.F. Handel which are today overlooked were worthy of our attention. One particular personality who I focused on was that of John Ernest Galliard, the German immigrant. Galliard was a central figure at the Lincoln's Inn Field's theater for nearly three decades where he wrote the music to numerous productions. 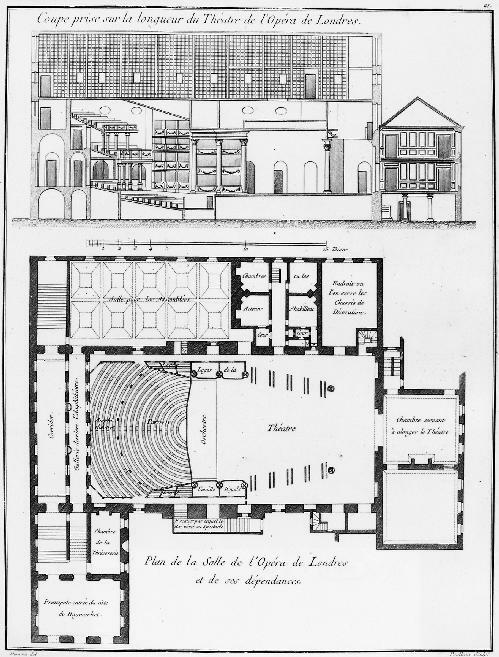 On 11 December 1744 a concert was given for his benefit (likely marking his retirement) at Lincoln’s Inn Fields. Following a performance of Love and Folly, as well as four choruses written for the tragedy Julius Caesar, a “Concerto grosso, 24 Bassoons, accompanied by Caporale on the violoncello” was performed. The concerto is the only work of this instrumentation on record and was more likely produced with the intention of creating a novel entertainment than for artistic reasons. Sadly, this work, as well as any other information about its performance, has been lost. In response to our predicament, I took it upon myself to compose a new concerto for 24 bassoons. Basing it upon a variety of music by both contemporary composers active in London, as well as those whose music Galliard was familiar with at the time of his benefit, this new concerto is stylistically plausible for the scenario of a performance in mid-century Britain. To be clear: my intention with this work is to present an entirely new creation, not to try and reconstruct the original using Galliard’s surviving works as a basis. Below you can find a selection of movements from the premier performance at the Schola Cantorum Basiliensis on 27 May 2016. All bassoons present are modern copies (pitched at A=415Hz) of originals made in the 18th century. A few days ago I had the chance to interview Lukas Henning, whose groundbreaking masterrezital was recently published on YouTube. After months of research, planning, and practicing, the performance was well received by all. Being in the audience myself, it was interesting to imagine the possibilities for such a "scenic production". For those of you interested in tuning and temperaments, there is a great two-part series published on YouTube by Early Music Sources. For those of you who were interested in my article on the Well-Tempered Clavier, watching these videos furthers the idea that, no matter how well-articulated the authors of these temperaments were, mathematically-fixed temperaments were not the reality four hundred plus years ago. A few weeks ago, my friend and colleague Lukas Henning had his Masterkonzert at the Schola Cantorum Basiliensis. 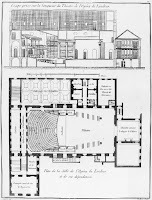 For his concert, Lukas went off the beaten path, so to speak, by creating a theatrical work which he hoped would help give a context to the performance and creation of the music at the Barberini court in early 17th century Rome. After months of work planning, arranging, composing, and practicing, the final product was the most unique presentation within Early Music that I have seen yet. Take a look. Recently, I read a post on David A. Wells's blog. In it, Mr. Wells details the process by which he wrote his own cadenza to the Mozart bassoon concerto. It's an interesting piece, one which had more than a few links to good material. In fact, I was surprised to learn that there is a D.M.A. thesis by a bassoonist named Sarah Anne Wildey, titled Historical Performance Practice in Cadenzas to Mozart's Concerto for Bassoon K. 191 (186e). The Transformers Theme: What Makes it Great? One of the greatest kids' TV shows of all-time, Transformers fueled the imaginations of a generation. Warring sentient alien robots, capable of transforming themselves into vehicles, bring their fight to earth. But, aside from that 1980's oh-so-cool premise, what was it that caught the attention of its viewers? I would argue it was the opening theme song (credited to Johnny Douglas). Every bassoonist has played a sonata by John Ernest Galliard at least once in their career. Many have been exposed to the International Edition of his bassoon sonatas of 1733, and they are commonly heard at a beginner bassoon recital. Though I encourage the use of this material as a teaching aid, I am disappointed to find that few see these works as appropriate artistic material for a mature performer. If seen through the lens of a modern bassoonist, the Galliard sonatas are easy pieces, if a bit quirky. If one were to contextualize them, however, they would see that they were a product of an important theatrical composer in early 18th Century London. In the next posts on the subject, let us reappropriate the Galliard sonatas. Two videos have recently been put up by bassoonist Eryn Oft, highlighting the recent masterclass Keith Collins gave for the bassoonists at Jacksonville State University. If you read this blog, you will likely be familiar with the material Keith covers, but I find his explanations to be, both in style and content, a very good introduction for those bassoonists who know relatively little about the instrument's history. In fact, Keith was the first baroque bassoonist I ever met. For two weeks I took masterclasses with him at TBSI in 2009. For years I have had issues with my reeds drying out to the point of the wires moving around. If you're a bassoonist, you know what I mean. Though submerging the reed in water gets the wire tension back, I often have to re-tighten. No matter the solution, once the wires come loose the reed's characteristics will never be the same. For years I tackled this problem with the RICO humidity packs. 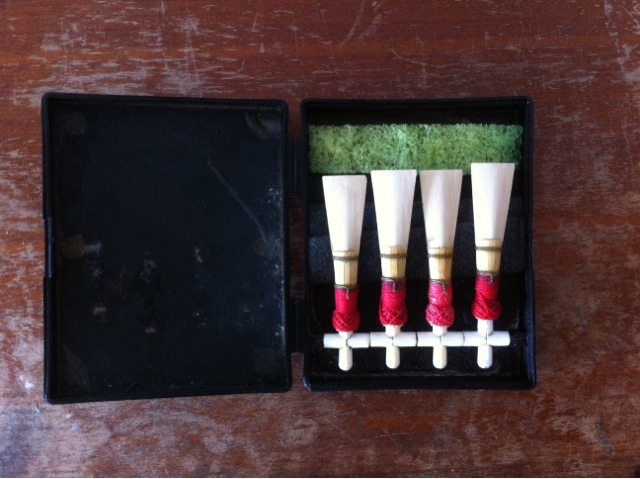 With my main box of reeds I would use the 73% packs but I found there was not enough airflow to prevent mould. Whenever I tried using the 50% pack I would find the entire box of reeds had gone mouldy within a week. Eventually I gave up on the RICO system and began soaking my reeds once every 12 hours, allowing time to dry before putting them back in the box. Unfortunately, there were always lapses in the routine, and sometimes I didn't have time to let the reeds dry enough causing mould to set in, After doing this process with many generations of reeds, I wondered if their overall lifetime was reduced from the constant soaking. How, I asked myself, was I going to keep my reeds humidified without mold setting in? I gleaned my next move from an advertisement for some 'sterile' reed box system. 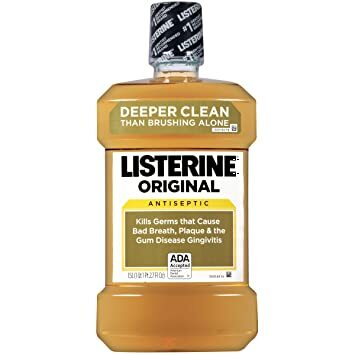 They recommended to soak a small sponge with the original formula Listerine once a day and put it in the box. Since September I've been maintaining my reeds using this technique and have found a dramatic increase in performance life. Though the reeds still need to be soaked before use, I've not seen a loose wire in months. It's a technique I highly encourage all bassoonists to try. While many begin to prepare for their end of year recitals, it is worth taking a moment to consider practical routines to let the body best facilitate a good performance. Over the last few years I have been experimenting with my diet and daily routines leading up to a big solo concert or audition. Below, you will find a list of different things which I have experimented with and have resulted positively. Understandably, not everything can be done all the time, but I think trying a few of these techniques might be beneficial to anyone's performance preparation. Over the past few months I've come across two great videos focusing on instrument makers. Take a look! Today marks the end of an incredibly busy chapter. Five weeks ago I boarded a plane to Amsterdam to begin the first of a series of projects which would test me both technically and psychologically. Sitting in Gatwick airport on my way back to Basel, I have yet to feel a sense of relief despite coming to the realization that I've survived this stressful period.